Our fully licensed Physical Therapists and Physical Therapist Assistants help clients improve their strength, mobility, coordination and functional tasks. Therapists use a variety of state of the art and specialized equipment (Lite Gait, Bioness L300 Plus, Ergys 2, Game Cycle) and aquatic therapy to assist in the clients’ rehabilitation. Our therapists work directly with staff and family members to help educate and train them on everything from assisting clients with mobility as a client progresses to assistive device repairs. 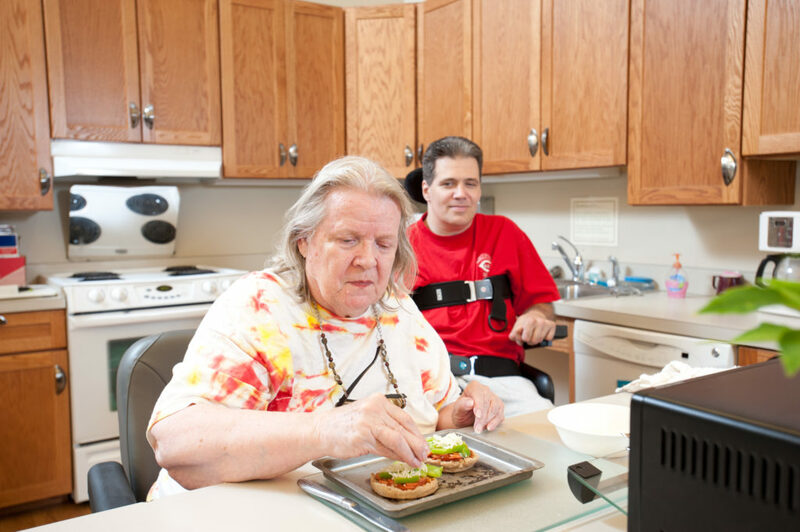 Our 1:1 approach provides client-focused rehabilitation with better outcomes. Improving cognitive-communication skills in the areas of attention, memory, problem solving, reasoning, organization, orientation, pragmatics, and executive functions by providing abstract cognitive training programs and hands-on ADL and IADL activities. Improving receptive and expressive language including reading, writing, auditory comprehension, and verbal expression for functional daily language use at home, work, or school. Improving swallowing safety using the National Dysphagia Diet by providing diet recommendations and modifications, compensatory swallowing strategies, and education. Improving motor speech disorders (e.g., dysarthria, speech apraxia, stuttering) through therapy focused on planning, sequencing, and muscle coordination during speech tasks using oral motor, breathing, articulation, resonance, and phonation exercises. Improving voice disorders (e.g., vocal fold nodules, spasmodic dysphonia) by providing therapy focusing on pitch, volume, and vocal quality. Training and support for augmentative-alternative communication via speech generating devices or communication books/boards.